← Wussten Kornilow und prorussische Kräfte im Voraus von der Tragödie in Odessa? 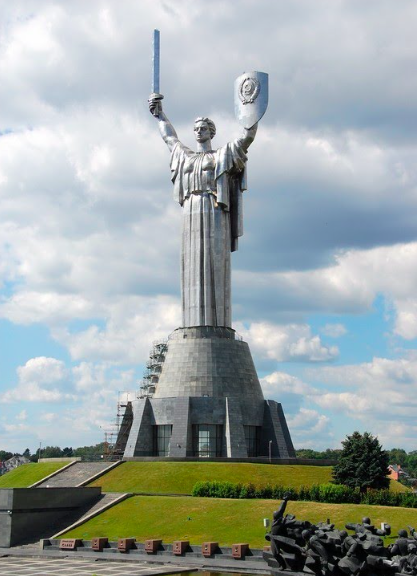 Why does the Motherland Monument in Kyiv face East? Why doesn’t this sculpture face in the direction of the enemy of the entire global proletariat? That is, she doesn’t look in the direction of the West, threatening all the imperialists with a sword while trying to protect her homeland with a shield. Rather, Mother Motherland looks in the direction of the East. I couldn’t find the answer to this question–couldn’t, until recently. Now I know why. The sculpture’s creator, Ukrainian sculptor Vasyl Borodai, judging by this, suspected where the enemy would come from in the future. That’s why the 100-meter [328 ft] statue is facing East. Mother Motherland is looking at Russia. And she holds the shield and the sword in her hands. And she is definitely aware from where the Fascists are coming. This entry was posted in "Voices" in English, English, Languages, Maidan Diary, Media, Pictures, Social Media, Voices of Revolution and tagged #CrimeaInvasion, #RussiaInvadesUkraine, #SaveUkraine, #ukraineprotests, civil society, fascists, Kyiv, Maidan, Motherland Monument, Russia, Ukraine, Vasyl Borodai. Bookmark the permalink. 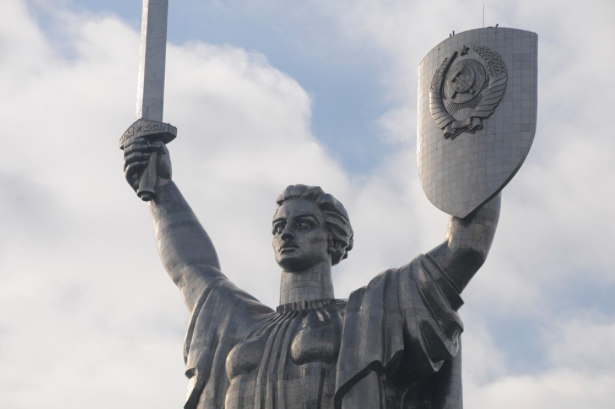 7 Responses to Why does the Motherland Monument in Kyiv face East? The Motherland Monument in Kyjiv stands into direction Russia to remind them of the Heroes of the Soviet Union and the Socialist Labor. Anyway, it makes no sense to show the shield with emblem of the Soviet Union inverse direction because Western Europe is not really keen on communism. I was told growing up that former Soviet republics have one of these in their capitals; facing Moscow. Also, built close enough to the Monastic Caves so that bringing it down would destroy the churches below. Sounds about right for Soviet evil. Would love to see her disappear along with the mentality of “looking to Moscow” she represents. I would love to see the hammer and sickle on her shield replaced with a trident. Good Idea Andy! She still represents our Motherland, but Ukrainian, not Soviet. This is an impressive piece of artwork. Historical artwork should stay as it was built. There is no reason to deny any historical association with USSR. Ukraine is its own master now and has the right to make whatever mistakes or successes they choose as FREE people!